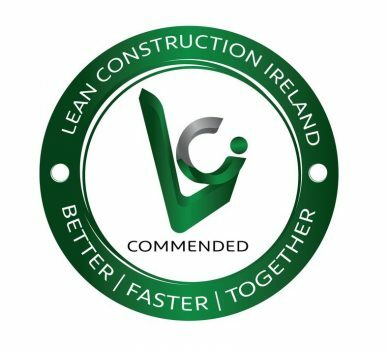 I am delighted to confirm that Team BDS is herewith approved as a “Lean Construction Ireland (LCi) Commended Lean Service Provider“. Congratulations, and I look forward to our ongoing engagement and collaboration as we contribute to enabling the transformation of the Irish Construction Sector. For and on behalf of the LCi LSP Capabilities Review Panel. Team BDS were recommended to us to assist in developing a revised software specification and sourcing a suitable partner who could deliver the solution to best fit our needs. From the outset their professional and structured approach filled us with extreme confidence that we were engaging with a partner who was not only well experienced but who equally placed great emphasis on ensuring value and best fit for our organisation was achieved. Throughout the process communication and direction was strong as was the overall diligence in procuring and recommending a suitable solutions provider. We will continue to develop our relationship further with Team BDS and have now engaged them in the execution of some other projects. Team BDS have provided ongoing business support to Universal Graphics over a period of time. They have always proven to have outstanding skills in various technical disciplines. They have helped us to achieve significant improvements in a number of key business areas. Equally important is the knowledge base they have created in-house through their approach to technical training and managerial support. At all times they seek to enhance the skills of the staff they engage with on a particular project. We have always had a very positive experience of working with Team BDS and continue to avail of their support. We engaged Team BDS to provide support to the company in applying innovation and process improvement to key business units. Their technical approach was very successful in identifying problem areas, and this was complemented by highly effective mentoring and managerial support. They have succeeded in implementing practical cost effective solutions which have significantly enhanced our processes and impacted positively on our P&L accounts. We continue working with Team BDS and have no hesitation in recommending them to anyone. We have worked with Team BDS on both Innovation and Lean Management Projects. We have always found that the consultants allocated to each project were not just extremely knowledgeable in their own specialist areas, but were experienced in a wide range of disciplines. They have a practical common sense approach to project management which looks at how a project will impact on every aspect of the business. They have helped Abcon in the development and management of the operation as we seek to re-orientate our business to become more export focused. We plan to continue availing of their support into the future. Team BDS identified the business system most suited to our needs. As we did not have a resource available to project manage the system implementation, this was undertaken by Team BDS. I can definitely state that we would not have had a successful implementation without their input. They took ownership of the project and managed to bring together all the elements and personnel which were required for a successful implementation.